My family’s photo was taken this year on the first Saturday of December. The smiling lady is me. If we were all to make a list of all the things we do at Christmas time, I’ll bet our lists would look fairly similar. 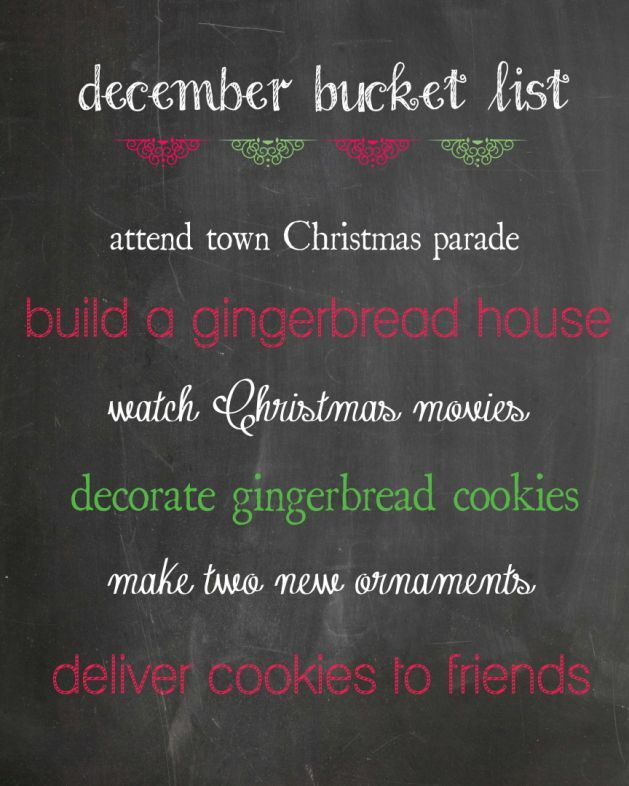 December Bucket List! A bucket list is what you want to accomplish before you die, yet this particular list may actually hasten death. In the midst of it all, we find ourselves identifying with Charlie Brown as he shouts in exasperation, Isn’t there anyone who knows what Christmas is all about?!? We have allowed ourselves to take on so many tasks in the name of Christmas, it’s no wonder that many of us look forward to it being over. Christmas has become something that we eagerly anticipate checking off our list. Another stressful season over; another year of our family’s expectations met (or not); another obligation survived. Where did the peace and joy go? And how do we get them back? I identified my #1 goal for the Christmas season. The goal isn’t an action, it’s an idea that determines my actions. Your goal may be different from mine. My goal is that I, my family, and other people in our lives would celebrate the incredible gift that God gave us by coming to earth in the form of baby Jesus, and that we would be drawn deeper into relationship with Him as a result. That’s the reason Christmas came into being in the first place: God, reaching out to humanity, making Himself available, personal, relate-able. And that’s what I want my life to communicate this season. I removed non-essential activities from my to-do list accordingly. I scrutinized it, asking myself, Do these activities support my #1 goal? If not, out they went! (or at least they moved to the bottom of the list. Some years, they get done; other years, they don’t.) This is why I quit mailing Christmas cards. Everybody I want to stay in touch with uses social media. If you send me cards, thank you very much. I do truly enjoy seeing the adorable pictures of your family and hearing your news. But please don’t be offended that I don’t send you one. It’s not personal. I decided which activities supported my #1 goal and I keep this in mind as I do them. Yes, we put up a Christmas tree and yes, we give gifts. But as we put up the tree this year, I talked to the kids about evergreens representing life. I explained that Christmas is a time to celebrate the life of Jesus and to be thankful for eternal life that He gives. (I still grumbled as I grappled with the impossible strings of lights, though.) As I wrapped gifts, I told my kids that we give gifts to each other to remind us of the gift God gave when He came to earth as a baby. When they tear open their packages on Christmas morning, they probably won’t be thinking much about Jesus. But I enjoyed the preparation more as I reflected on why I was spending my energy on those activities. There is meaning behind it and that brings me joy. I actually added, yes added, some activities that would help point me and my family toward the #1 goal. We agreed with the adults in our extended family to do less gift-giving and donate to a charity instead. 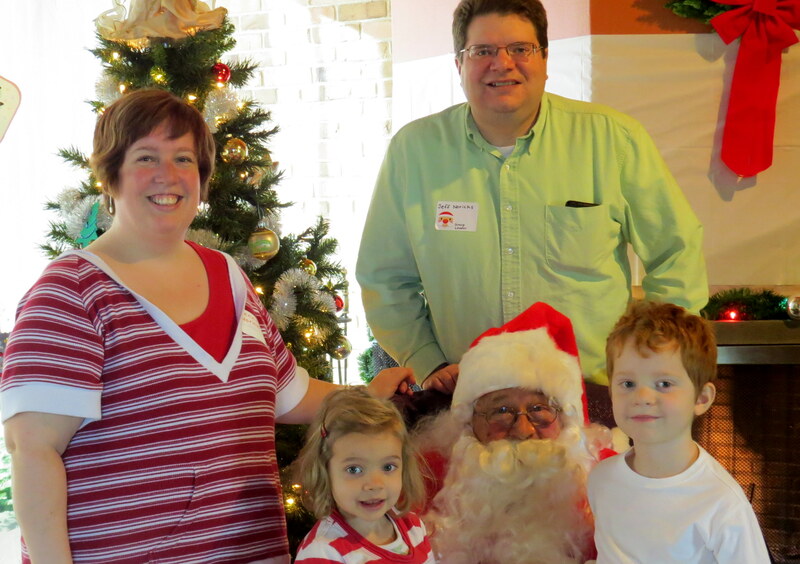 The day we had the above photo taken with Santa, I had organized an event through my church, Milk & Cookies with Santa. Sixty kids from our neighborhood attended. Some of them heard the Nativity story for the first time. For the families who are seeking something more this Christmas – an appointment with the Wonderful Counselor; a touch from the Mighty God; a word from the Prince of Peace – this was an opportunity to get acquainted with the neighborhood church. I do not regret taking on that project during this busy time of year. It met my #1 goal in ways that I did not anticipate. Stress + Dread + Anxiety = Christmas. Can you imagine the carols of old reflecting our present-day mindset? The Savior of the world didn’t come to earth to make your life harder. Quite the opposite, in fact. Jesus said, “I have come that [you] may have life, and have it to the full” (John 10:10). I love the lyrics of this Christmas hymn, written by Charles Wesley. This year, I pray that you will be reminded anew of the beauty of Christ’s coming to earth. And God is all our own! Next Next post: “Blessed are those who defend their rights,” said nobody, ever.